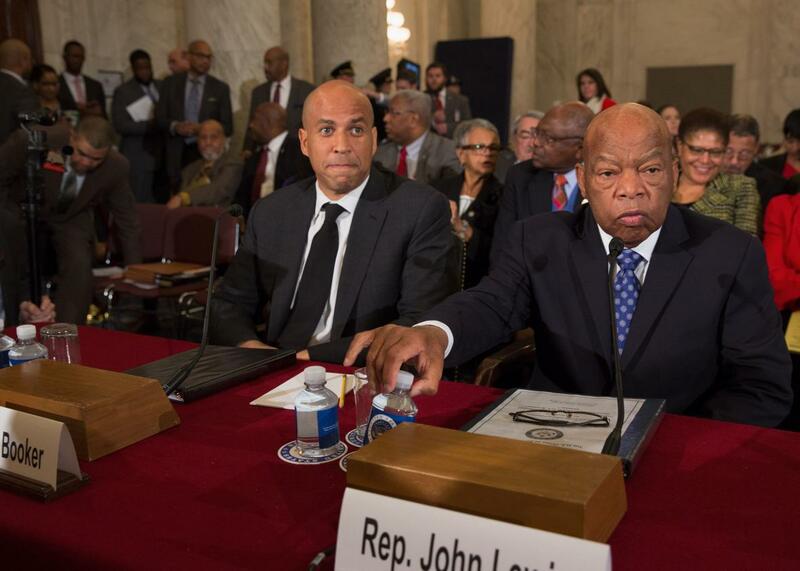 Why aren't more Democrats rallying around John Lewis? He questioned Trump’s legitimacy, but for too many others the forms of democracy seem to matter more than the thing itself. U.S. Rep. John Lewis prepares to testify Wednesday against Donald Trump’s nominee for attorney general, Sen. Jeff Sessions. A new conventional wisdom is emerging among Very Serious People in Washington, D.C. It essentially holds that while Russia intervened on Donald Trump’s behalf in America’s election, questioning Trump’s legitimacy only plays into Russian hands. Marco Rubio articulated the new line in his questioning of Mike Pompeo, Trump’s choice for CIA chief, on Thursday. Rubio began with a series of false equivalences: “A president-elect who has questioned at times the judgment of our intelligence agencies. Opponents to our president-elect who continuously question the legitimacy of his election. The shameful leak in the media regarding unsubstantiated, unsourced information designed to smear the president-elect.” Given all that, he asked, “Is Vladimir Putin looking at all this and saying, ‘We’ve done a really good job of creating chaos?’ ” With this, Rubio conflated the behavior of Putin and Trump, which raises questions about Trump’s legitimacy, with the act of merely asking those questions. It’s a way to shut down attempts to reckon with the existential crisis Trump’s elevation poses to our faltering democracy while maintaining a centrist, Trump-skeptical pose. Democrats should be pushing against this conventional wisdom, hard. So far only a few have stepped forward. In an interview to air on Meet the Press Sunday, U.S. Rep John Lewis, legend of the civil rights movement, told Chuck Todd that he does not consider Trump a legitimate president. “I think there was a conspiracy on the part of the Russians and others to help him get elected,” Lewis said. “That’s not right. That’s not fair.” For the first time in his 30 years in Congress, Lewis said he would not be attending the inauguration. “You cannot be at home with something that you feel that is wrong,” he said. Lewis was speaking for many of us who are aghast at the way Trump benefited from Russian hacking and now appears to be returning the favor by taking a fawning stance toward Putin. He spoke for those of us who are shocked by the role of the FBI, which improperly publicized the reopening of its investigation into Hillary Clinton’s emails but refuses to say whether it is investigating Trump’s ties with Russia. Trump lost the popular vote; he is president-elect only because the country values fidelity to the democratic process over popular democracy itself. (The Constitution, it turns out, may in fact be a suicide pact.) If the process itself was crooked—if Trump’s campaign colluded in any way with Russia—his legitimacy disappears. If he scorns the Constitution by, say, violating the Emoluments Clause, it disappears as well. A president who lost the popular vote, who may have cheated to win the Electoral College, and who will be contravening the Constitution the second he’s sworn in is due neither respect nor deference. Not surprisingly, Trump lashed out at Lewis on Twitter, saying the congressman should work on fixing his “crime infested” district. “All talk, talk, talk - no action or results,” Trump added. This is a grotesque thing to say about Lewis, an original Freedom Rider, a principal organizer of the March on Washington where Martin Luther King gave his “I Have a Dream” speech, and a man who was beaten nearly to death by Alabama state troopers while trying to march from Selma to Montgomery. It turned out to be just the thing to stiffen some Democratic spines, and soon Democratic members of Congress—including Jerry Nadler, Yvette Clarke, Ted Lieu, and Mark Takano—said they would boycott the inauguration in solidarity with Lewis. They joined a group of lawmakers who’d already announced that they were staying away, including Earl Blumenauer, Barbara Lee, and Raúl Grijalva. This is a legitimate fear: Nobody knows where this is all going. Democrats particularly are in a difficult position, because they want to uphold basic political norms, but doing so alone, while the other side shamelessly flouts them, puts them at a constant disadvantage. The peaceful transition of power is a cherished value of our democracy. But it’s not the only value, or the highest one. It should not require us to sleepwalk into authoritarianism. If the price for preserving our democracy is pretending that our would-be god-king-emperor has clothes, then it’s already rotted beyond repair.